Favorite Line: "I don't think there is being brave, anyway. I used to not tread in puddles in case I fell in them and died like Mummy did. But then in the autumn when it flooded I got stuck and had to splash through one. It didn't feel safer or worser. I just had to splash through it or wait until the sun came up and it all dried out." This was a beautifully written book. There were so many interlocking stories, all about relationships and love lost and found. Ida and Midas are in the center (I wonder if their names are similar for a reason). Ida wants desperately to connect with someone before her illness leaves her cold, literally. Midas is drawn to Ida, but he must overcome his innate dislike of touching or even really interacting with other people. Their relationship is central to the plot, but there are so many that are similar to it that reach different conclusions. For example, there is Midas' friend Gustav, who fell madly in love with a woman, and she fell in love with him, too. But before they had spent much time together, she passed away. There is Henry Fuwa, who was in love with a woman, but she was already married and now he thinks it's too late to go after her. Carl Maulsen was in love with Ida's mother, but she wouldn't have him and so now he hopes to help Ida and somehow affect her mother. Elianna, who fell in love with Carl and realized that he would never love her. Midas' father was unfeeling and never cared for his wife or his son; his son now cannot touch anyone and his wife is withering away, at age 50, in a retirement community. 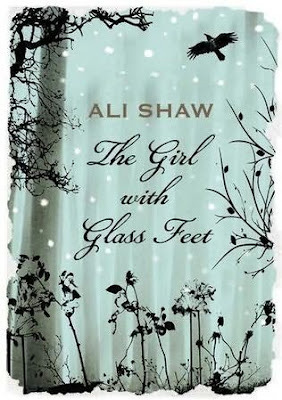 Each relationship presented in the story represents and symbolizes a different version of love, and it's fascinating to see how Shaw weaves the illness of bodies turning to glass into all of it. For an author that is only 27 years old (a year older than me, only! ), he writes with a very lyrical touch. I really enjoyed both Ida and Midas as characters. Ida was so strong and faced her problems head-on. Even though she has a seemingly incurable illness, she goes after what she wants and refuses to cater to anyone else. Midas, too, grows so much during the novel, from a shy, socially awkward person always frightened that he will turn out like his father, into a man who stands up for himself and takes risks even when they terrify him. The Girl with Glass Feet is a slow, sad novel that meanders around on an isolated island. I think you have to be in the right mood for it- I read it curled up inside on a miserable rainy day, and that was the perfect setting. Shaw has a gift for descriptive passages, and he's an author I will follow. This sounds like a really unique read. I liked the quote you provided as well. I think it's really quite interesting the way the author focuses on relationships and features so many of them in the book, and now I am wondering how some of them ended up turning out. Awesome review, and another book recommendation from you that I think I should check out! Linda- It's probably perfect for the kind of day we'll be having for several months now, I bet!